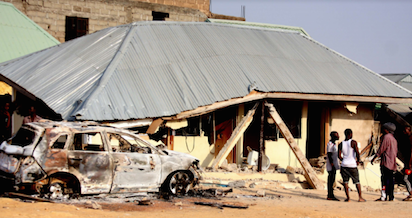 An upheaval on Thursday morning in Kaduna state has left a church and a police station burnt by youths numbering about 200 in Narayi, Chikun Local Government Area of Kaduna. It was gathered that trouble started following the death of a boy who worked for a White garment Church. The rampaging youths burnt down the Church and the Police station when they demanded that the Police in Narayi hand over to them the pastor in charge of the church where the young man died. It was gathered that the Police had taken the pastor into protective custody after he had reported that a youth doing some construction work for the church had died in the process. An eyewitness said that the hoodlums outnumbered the Police personnel on duty, hence they ran away for safety, leading to the burning of the Police station by the angry youth. He said that the youths also made away with no fewer than seven motorcycles belonging to policemen as well as vandalising a Honda Accord vehicle belonging to an officer. The Church was still burning around 9:30am. Four other buildings were pulled down at the Church premises but the church was razed down completely.